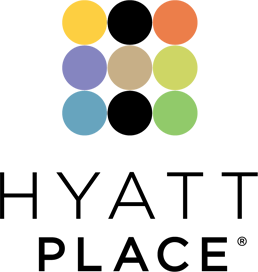 Like the eclectic neighborhoods around them, our 165 rooms draw inspiration from both Knoxville’s past and present. 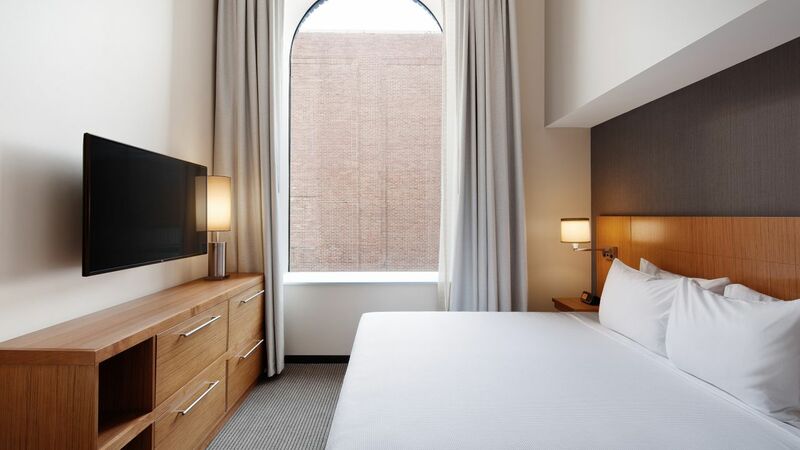 Relax in a spacious room near the Knoxville Convention Center during your stay in the restored, century-old Farragut Hotel. 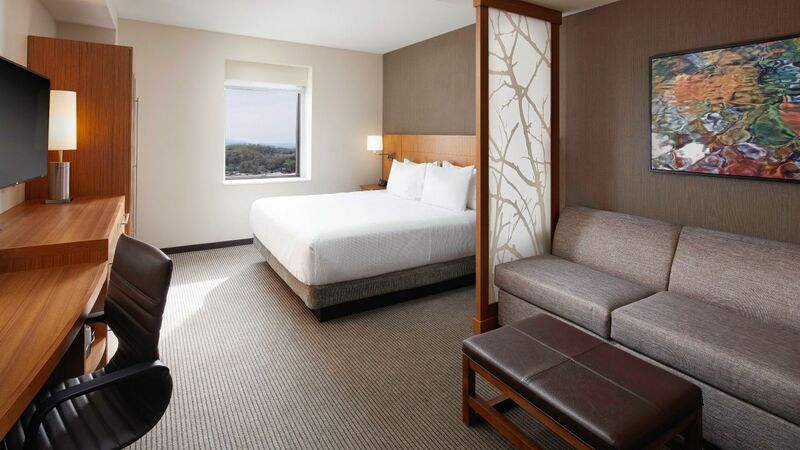 Enjoy postcard-worthy views of downtown from your room at Hyatt Place Knoxville / Downtown. Treat yourself to a plush king bed, 828 square feet of space, a living area featuring a Cozy Corner with sofa-sleeper, and workspace in this one-bedroom suite. Look out over downtown Knoxville from this 504-square-foot room, complete with a king bed, ample workspace, and a Cozy Corner with sofa-sleeper. Views the city skyline from this 448-square-foot room, which offers two queen beds, a Cozy Corner with sofa-sleeper, and a spacious work desk. Marvel at the Smokey Mountains or historic Gay Street with extra space and windows from this 451-square-foot room complete with a king bed, convenient work desk, and a Cozy Corner with sofa-sleeper. Enjoy extra windows offering views of the Smokey Mountains or historic Gay Street from this 451-square-foot room offering two queen beds, a Cozy Corner with sofa-sleeper, and a spacious work desk. Overlook historic Gay Street and Krutch Park from this 378-square-foot room complete with a king bed, a Cozy Corner with sofa-sleeper, as well as a spacious work desk. Sink into a king-sized bed in this 378-square-foot room that includes a Cozy Corner with sofa-sleeper, as well as a spacious work desk. Rest easy in this 439-square-foot room complete with two queen beds, a Cozy Corner with sofa-sleeper, and a handy workspace. Relax on a king-sized bed in this 504-square-foot room offering a Cozy Corner with sofa-sleeper and workspace, as well as ADA features such as a bathtub. Make yourself at home in this 576-square-foot room featuring a king bed, Cozy Corner with sofa-sleeper, work desk, and ADA features such as a roll-in shower. Sleep comfortably in this 476-square-foot room, which includes two queen beds, a Cozy Corner with sofa-sleeper, work desk, and accessible features such as a tub. 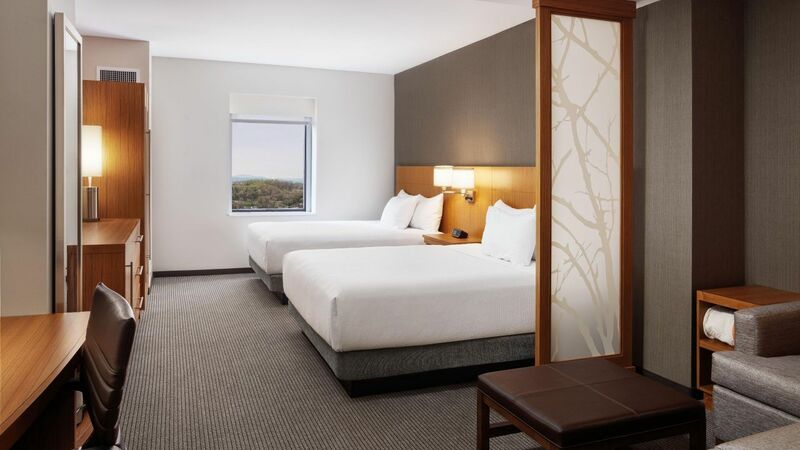 With 476 square feet space, our two-queen-bed room features a Cozy Corner with sofa-sleeper, a work desk, and ADA-compliant amenities including a roll-in shower. 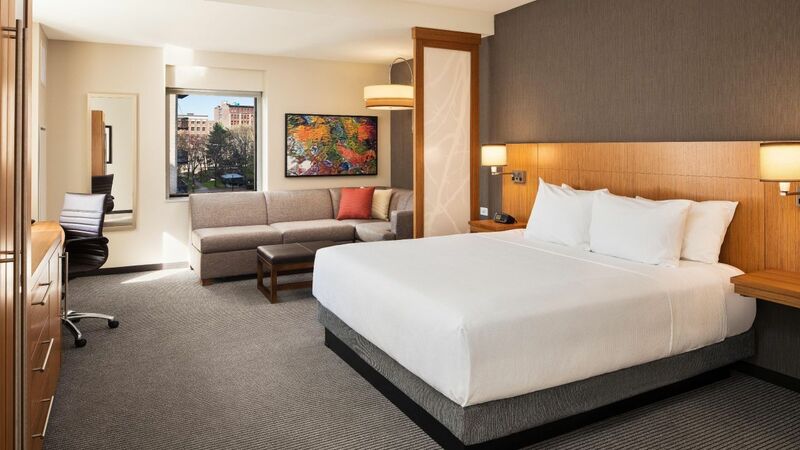 Relax amid 696 square feet of space, in our one-king-bed suite with a Cozy Corner with sofa-sleeper, work desk, and ADA features such as a roll-in shower.